Having a hoverboard and hanging out with friends have become a trend among the teenagers. Because of colorful design and easy riding facility, hoverboard has been getting overwhelming popularity since the invention. Are you planning for hover-boarding or simply looking for a beginner level self-balancing scooter for your kid, then this Razor Hovertrax 2.0 can be a good purchase for you. The hoverboard is well-designed, safe and perfect for the beginner level riders. Do you want to know how this smart scooter is well-designed, safe and perfect for the beginner? Check this Razor Hovertrax review. Before moving to the review section, let’s read some information about the manufacturer behind this smart scooter. Check out top self-balancing scooter. Hoverboard faced a rise in popularity after invention, yet experienced downfall after that rise. However, they bounced back strongly, and it was possible because of some prominent manufactures, Razor is one of them. The Razor is an American based sports materials manufacturer; they produce safe and quality products for the riders. You might hear about the popular kick scooter, which took the country by storm in 2000. Inspiring from the overwhelming responses of kick scooter, Razor started manufacturing self-balancing smart scooters. Today’s Razor Hovertrax 2.0 is the result of their dream converted into reality. The aim of Razor Hovertax 2.0 design is to make this hoverboard safe and well performing. Razor Hovertrax 2.0 is the successor of Razor Hovertrax hoverboard scooter. The board is designed with colorful scratch resistant materials and dual panel LED lights. These materials along with other riding facilities made this board one the smartest hoverboards out there. Polymer frame shatter-resistant plastic materials were used to construct this self-balancing scooter, while the silicone reinforcement on contact areas was also added to protect the finish. Additionally, the fender bumper protection was used to safeguard this Hovetrax 2.0 against dings. Addition of ever balance technology makes this board dynamic and well-balanced. This technology makes the hover-boarding even easier to get on and off from the board. In traditional self-balancing board you have to get on the board to make it balanced, but here when you switch on the board, the board will be balanced by itself. This self-balancing system reduces the possibility of sudden disparity and makes the riding easier for the beginner. The Razor Hovertrax 2.0 features a “training mode” system. The mode limits the speed and responsiveness of control for the rider. In training mode, the smart scooter responds slowly so that the rider learns how to ride and get a move. This feature allows a new user to get accustomed to the Hovertrax 2.0 hoverboard. An authentic LG Lithium-ion battery has been installed inside the Hovertrax to provide power to the motor system. 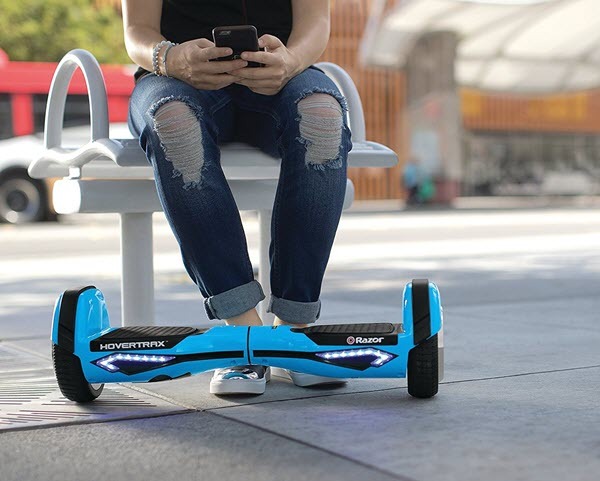 The lithium-ion battery has UL 2272 electric systems certification, which ensures that the hoverboard is safe contrary to a common problem with the cheaper hover boards with battery issues. Besides, the battery is detachable and you can replace the battery when it is damaged. With a full charge you can enjoy 60 minutes of continuous riding with the Hovertrax, the time is longer than most of the hoverboard scooters on the market. However, the riding time may differ for rough and tough terrains. The Hovertrax hoverboard is featured with 15-degree tilt, which allows the board to climb small hills, also ensuring smooth riding on the uneven ground. This self-balancing scooter is featured with anti-slip rubber foot platforms on both sides. This rubber platform offers grip and stability to the rider. 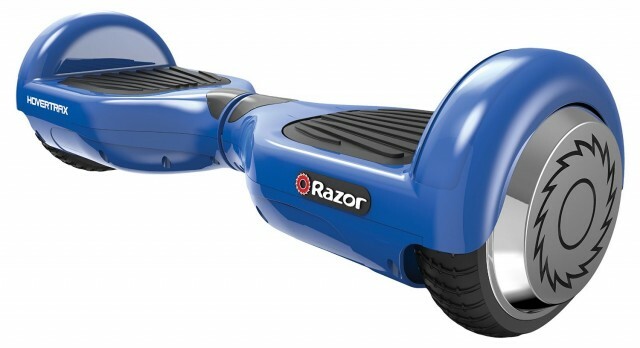 As the Razor Hovertrax 2.0 is a beginner and teenager friendly hoverboard it has a moderate speed limit. The board has a top speed of about 8mph, which is good enough for the novice class of riders. The hoverboard has a 350-watt motor. The motor operates in silence, so your board will never be the cause of sound pollution. The Hovertrax hoverboard comes with dual panel LED lights. Here, you will find a set of LED lights at the front of the board indicating the throttle, while another set of lights found on the main surface indicates the battery level. The Hovertrax 2.0 hoverboard is a good performer, especially on the concrete ground. The rubber wheels and axle construction of the hoverboard ensures a smooth ride for the riders. 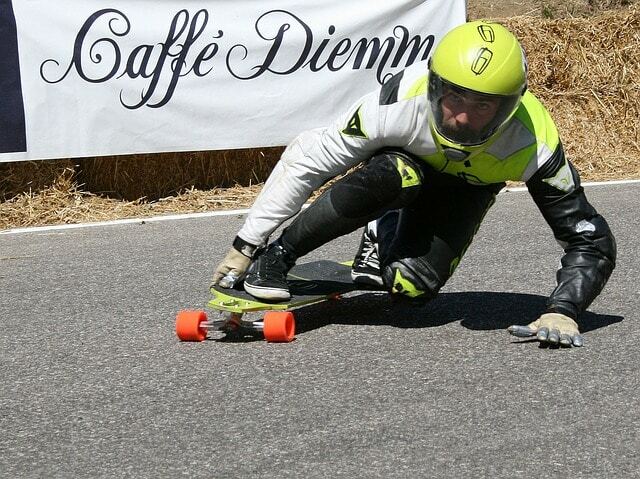 Furthermore, the board is responsive and easy to get the desired movement while riding. Because of the ever balance technology and anti-rubber footpad a rider will able to maintain his desired balance when he rides at top speed. The hoverboard is made with shatter-resistant polymer, which made this board scratch resistant; as a result, your hoverboard will shine even after the days of riding. Additionally, the fender bumper also provides protection against bumps. Razor Hovertrax Hoverboard has got UL 2272 certificate for the safety issue, which means that the battery has passed incredibly strict safety standards. So, don’t worry about firing or explosion, just enjoy your riding. Learn more how to control self-balancing scooter? b. Training mode and Normal mode. e. The safest choice for concerned parents. f. A good pick for the beginners. a. The board is not good for off-road grounds. c. Not water resistant enough. The hoverboard is the best for the beginners and kids who are more than 8 years old. This self-balancing hoverboard performs well on the concrete ground, so those who are likely to ride more on a smooth ground can go for it. Actually, these are the features that made this board the first choice of many hoverboard lovers around the world. If you love hoverboard, then you will love it too. Also, don’t miss a chance to see the blissful smile on your kid’s face when you gift it to him. This will give him/her a chance to spend a quality outdoor time. Question-1: Does this Hoverboard blow up? Answer: No, it’s safe. The board is UL 2272 certified. Question-2: Does this hoverboard work on a gravel road? Answer: No, it is horrifying to ride on any sort of irregular surface. The board works best on the flat surface. Question-3: Does this hoverboard work well on inclines? Answer: Yes, it functions very well on inclines. Question-4: Can I ride Hovertrax hoverboard on grass? So, what do you think of this self-balancing scooter? Let me summarize the Razor Hovertrax review right here for you. Razor Hovertrax self-balancing scooter is featured with scratch resistant body design, safety replaceable battery, 8mph top speed, 60 minutes of continuous riding aptitude, and it works best on flat grounds only. wanted to see more options? see Swagtron vs Segway.